Entry filed under: dogs, feelings, friends, love, musings, Personal, Pets, poetry, ponderings, Relationships, Valentine's Day. Tags: animals, friendship, funny, greetings, life. Oh, Kim!!!! Pee made my day. She looks beautiful 🙂 Thank you so much for this…Happy Valentine’s Day to you and yours…kisses on Pee, hugs too. This is beautiful, Kim!! Loved it!! Never will she run out of head wear. I took costuming for a year in college – I can be quite inventive! Thouest is truest on this, as wellest. Cybers back to you Pee. The wind has died down considerably. Yes, she got all dolled up for the occasion:). She looks good in red…. 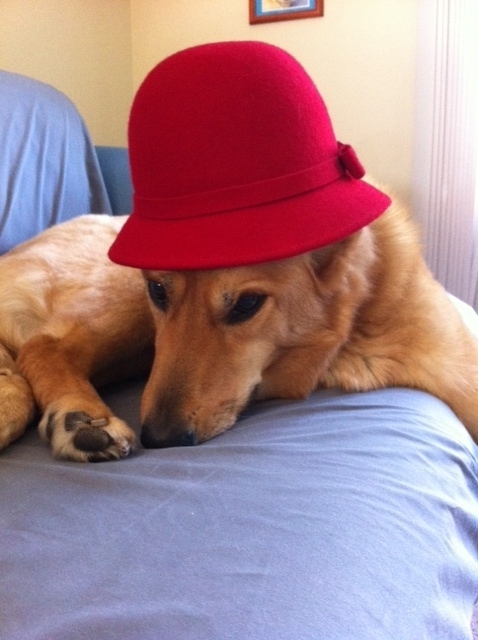 Oops, I meant red hat! Dang the autocorrect!